Many users may have stumbled upon interesting, unique, weird, funny or unusual digital photo or images from time to time when they browse the Internet. They may save these photos and later use them to set as the desktop wallpaper. However, sometimes the images end up as junk in their computer for users forget to add them as wall paper. In order to cut down the steps involved in converting the images to wallpaper and to simplify the process, users of Google Chrome can try out this simple extension, Set Image As Wallpaper. Set Image As Wallpaper is a free Google Chrome browser extension that works in Windows only at this point of time. Via the extension installed to the browser, users can skip the saving process and straight away right click the image. 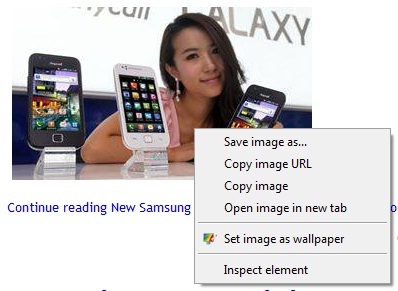 Users can then choose “Set image as wallpaper” in the pop-up shortcut menu to set the selected image as wallpaper. Users are also given options to adjust the format if they want to stretch, tile or center the selected image as their wallpaper. This simplified process will enable users to put up interesting wallpaper and change it more frequently. Download Set Image as Wallpaper Chrome extension.